New Zealand-owned global health software company Orion Health has opened an office in the Philippines that will become a South East Asian hub as the company grows and invests in the region. The office will add to Orion Health’s 27 other offices around the world and 1,100 global staff members. The company’s health software products are used in more than 30 countries by hundreds of thousands of clinicians to facilitate care for tens of millions of patients. Orion Health CEO Ian McCrae says the office in the capital Manila will initially have up to 20 staff but the company plans to grow this over the next 12-18 months as it builds aspects of its implementation and customer service operations in the Philippines. Mr McCrae said the office will also support Orion Health’s new partnership with The Medical City (TMC), a world class tertiary care hospital and healthcare complex with 1,000 physicians and 2,200 staff serving some 40,000 in-patients and 400,000 out-patients annually. TMC has bought Orion Health’s Enterprise Electronic Health Record system. Orion Health’s solution will provide a unified view of patient data across the healthcare organisation via an easy-to-use web-based interface that is accessible anywhere, anytime. Its implementation will help to reduce medical errors, increase medical staff efficiency and reduce costs. Mr McCrae said Orion Health’s and TMC’s visions are aligned. “TMC’s vision is all about working in partnership with the patient, and we are also focussed on patient-centric care. At the heart of TMC's service philosophy are new paradigms of hospital care addressing the entire continuum of health needs, and treating the patient as an equal, informed and empowered partner. TMC is accredited by the Joint Commission International (JCI), the world’s most prestigious accrediting body for international health care organisations. Besides its Philippines base, TMC has hospitals and clinics in Dubai and Guam. 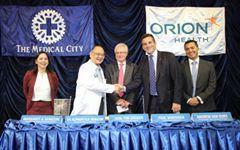 Orion Health and TMC officially signed an agreement for their partnership today which was attended by a ministerial delegation to the Philippines led by New Zealand Minister of Trade Tim Groser.